Last week must have just been the calm before the storm… this week was pretty awesome! Our primary fall objectives continue to be to recruit new students and train them to a level where they feel comfortable contributing in the Spring FRC season. 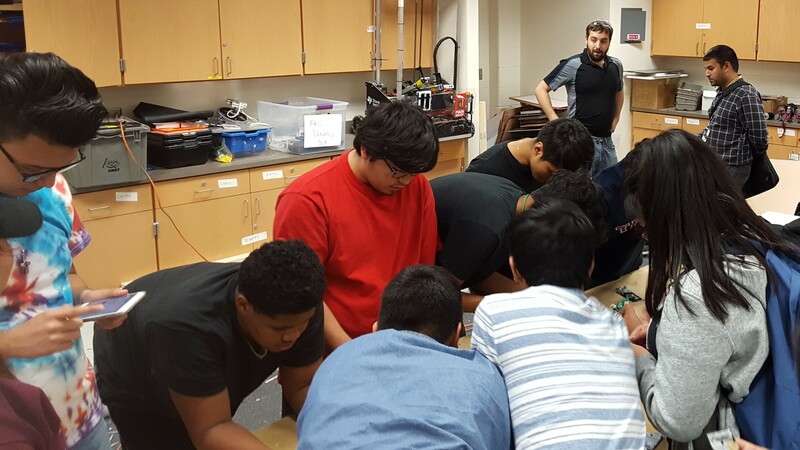 Some feedback we received in prior years was that it is good for new students to walk into the room for their first time when we have a clearly defined project that feels like “robotics”, versus some of the engineering challenges we had done in the past. To facilitate this, we had our team spend a week brainstorming various project ideas, searching through Instructables and MakeZine to find projects they thought were interesting, and involved some basic building skills. We opted to go with a “Bristlebot” project as well as a rubberband powered racecar. The new student turn out was amazing, with approximately 15 new students participating in the two open meetings. 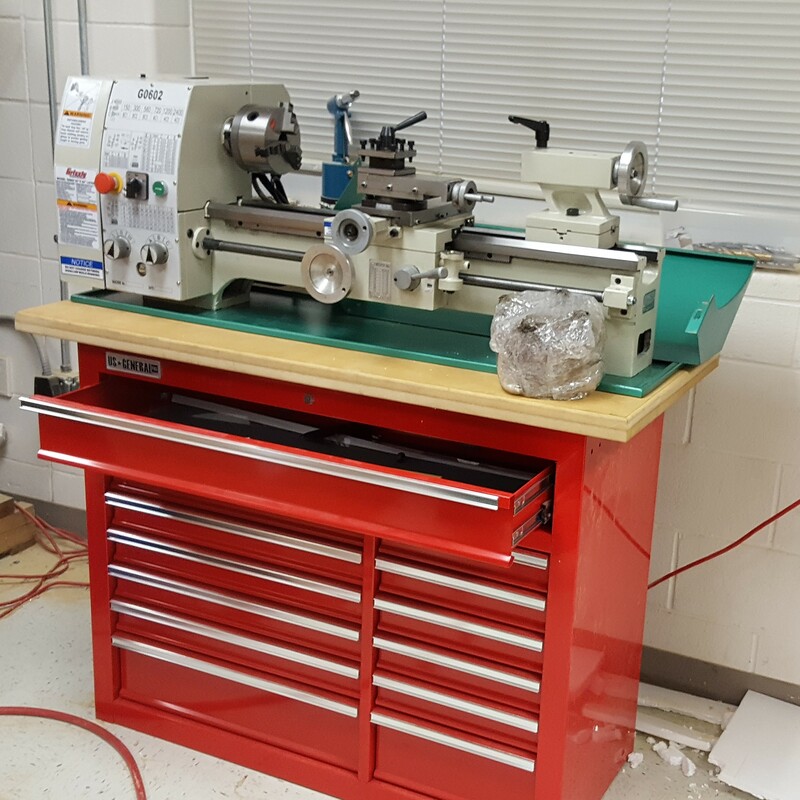 We finally got the lathe mounted up on a stand (of sorts). Opted to go with a Harbor Freight 44″ toolbox for ~$350 after coupon. It gives us some extra storage for the machine tools, and the box is technically rated well over the weight of the lathe. We had to layer in some MDF for the lathe to clear the top lip. We also popped off the wheels to lower the overall height to something more manageable. Unfortunately, there is a slight rock due to either the floor not being quite level, or the box flexing slightly (hoping it is the former), so we probably need to get under there with some shims. Again, probably trading absolute accuracy for convenience, but it should hold up just fine for now. On the MakerMill front, we were finally able to get our CAM created and first test cuts done. As you can hear in the video below… speeds and feeds could use a little bit of work. But hey… feels good to make some chips (or dust). Good guy Frank decided to bless us all with a teaser video… and he did not disappoint. No clue what we’ll be doing on the robot front this year, but our Etsy store is going to be flush with awesome SteamPunk themed projects. Next week, we’re looking forward to finally building some robots again. Won’t tread too heavily on next week’s post, but we can’t wait to get our new students up to speed on game design and construction with BEST. 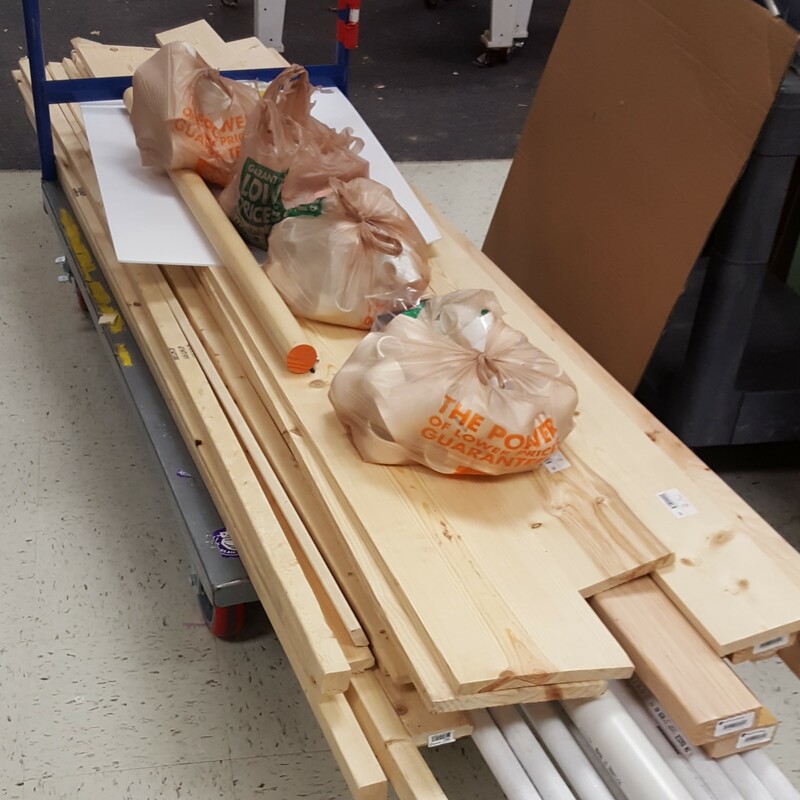 The hub was nice enough to give us the parts list for the field a few days in advance, so we got to play a couple hours of SuperMarket Sweep at HomeDepot to prepare. Ended up making a quick highlight video for fun and practice. Enjoy!